We’ve all heard this simile to describe something difficult: “Like herding cats.” Apparently Jaguar isn’t afraid of a little challenge because it is adding to its herd in the F-Type sports car family. Twenty seventeen sees the debuts of a lower-cost base “F” and a line-topping high-performance SVR—and the 2018 lineup will be larger still. 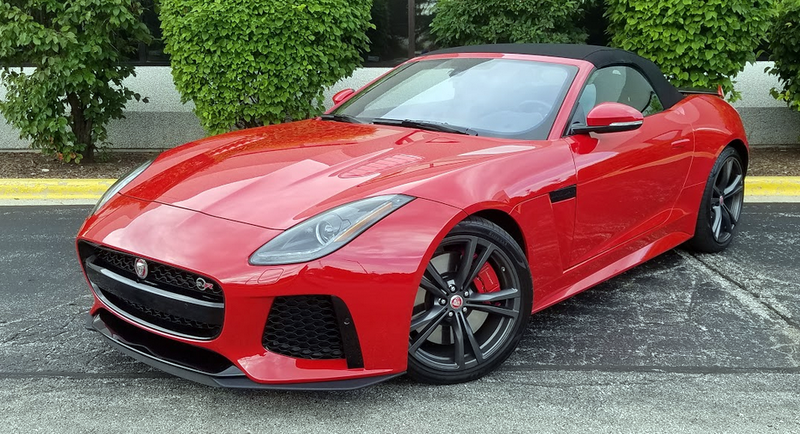 Quad exhaust tips and a carbon-fiber decklid spoiler give the F-Type SVR an especially aggressive look, and the ferocious acceleration–and hair-raising growl from the active exhaust system–back up the styling. 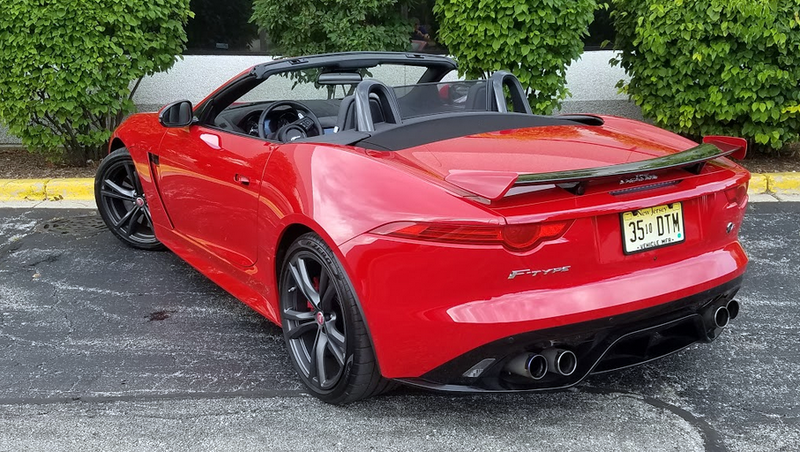 From among the new ’17 models, Consumer Guide® had the chance to test the very top of the line, the 575-horsepower SVR convertible. Its starting price of $128,800 is $2850 more than the tab for the SVR coupe—and almost twice the cost of the new entry-level ragtop. With a small group of options (mostly appearance items) and delivery, our Caldera Red test car topped out at $132,283. The F-Type SVR’s cabin is cushy and impeccably trimmed with diamond-tuft upholstery, red contrast stitching, and suede inserts on the seats and dash. The nicely bolstered seats offer a fine mix of comfort and support. Cabin space is at a premium, though the small covered “dispatch box” between the seats is a handy spot for stashing small items. Speed is the name of the SVR’s game. Jaguar says the supercharged 5.0-liter V8 and 8-speed “QuickShift” automatic transmission make it capable of accelerating from rest to 60 mph in 3.5 seconds with a top speed in the vicinity of 200 mph. However, it also packs a fair amount of luxury into its cozy cabin. The two heated and highly bolstered 14-way-adjustable sport seats are clad in leather and suede, and were highlighted in the test car with red contrast stitching. A quilted diamond pattern is sewn into the seats and center of the door panels. Soft-touch surfaces cover almost all the interior, and optional carbon fiber adorned the center console. Other standard features include a heated SVR-branded leather steering wheel, a 770-watt Meridian audio system, satellite radio, Bluetooth connectivity, dual-zone climate control, navigation system, parking-assist sensors, rearview camera, blind-spot monitor, remote keyless entry, and flush door handles that pop out when the doors are unlocked. As is typical with high-end two-seat convertible sports cars, the F-Type’s trunk space is very tight. An inflator kit takes the place of a spare tire. That bright blue cap covers the filler neck for the windshield-washer fluid. But, yeah, about that engine. . . . The supercharged mill responds quickly and forcefully to even halfway-serious driver inputs. It vents its aggression through a 4-port lightweight titanium “active” exhaust system with adjustable internal valves that can free up the flow of spent gasses. With the driver’s right foot firmly down, the plumbing begins gargling gravel at about 2500 rpm, which is 1000 revs before the SVR hits its peak torque of 516 lb-ft. (It’s much cooler to actually hear it than it is to read about it.) Fortunately, for those moments that call for greater decorum, the note is more genteel in the normal mode. SVR badges reside on the grille and rear fascia. Dark-finish 20-inch forged-alloy wheels are standard equipment. The SVR comes with Jaguar’s “Instinctive” all-wheel drive that shifts as much as 90 percent of power to the front or rear wheels as road conditions dictate. Also included is an “Adaptive Dynamics” suspension with continuously variable damping and “predictive” shock-absorber adjustments. Rolling on specific 20-inch forged-alloy wheels, there’s a little hop in the ride but no jarring suspension crashes on bumps. Cowl-shake is well contained. Steering is direct and highly responsive, and braking is excellent. A standard carbon-fiber wing rests on the decklid to provide extra aerodynamic downforce for high-speed stability. In terms of passenger room and comfort, foot-well space is a little narrow. Headroom under the raised top is passable—it certainly was better than the headroom in a Chevrolet Corvette Grand Sport that CG tested previously (though top-down wind buffeting in the Jag seemed somewhat worse). Driver vision with the quickly deployed power top up isn’t bad but something of an over-the-shoulder blind spot remains. The F-Type’s power soft top raises or lowers quickly. Headroom with the top up is cozy at best, but competitive with most other two-seat sporty convertibles–and a bit better than the Chevrolet Corvette ragtop. Working the infotainment system is simpler than in some luxury brands—no remote control!—but still requires quite a bit of attention to the touchscreen in order to get what you want. Independent climate controls use a combination of dials and toggle switches. Key driving instruments and the vehicle-information display between them show up well. Interior storage is not so great, with a smallish glove box and covered arm-rest console box. Door pockets, a small “dispatch box” in the vertical panel between the seats, and two covered cup holders also serve occupants. Convertibles now have slightly more trunk room, all of 7.3 cubic feet. However, the space is oddly shaped. The deepest part is in an “L” shape, and space is on two levels, essentially trying to wrest every bit of possible room from the trunk. You’ll have to wedge things in as best you can. A flat trunklid requires a high liftover, but its piston-type hinges don’t cut into trunk capacity. The price for a Jaguar F-Type SVR is unquestionably high. However, its blend of sophisticated surroundings and muscular verve should make it desirable on several levels for the kind of shoppers who can think in terms of 6-figure cars. The 2017 Jaguar F-Type SVR is about as red-blooded as premium sports cars come. It mixes posh luxury with spine-tingling performance–and a surprisingly snarky character in terms of both its styling details and exhaust note. Written by: The Daily Drive staff on August 30, 2017.on September 7, 2017.